Caribbean Holidays slots game is as good as a real vacation. Caribbean Holidays is a slot game with a happy holiday theme that is fun to play, and offers the chance to earn a little cash for your real holiday. The Caribbean Holidays slots game was developed for players who dream about a tropical holiday, and the experience of playing this game will be greatly enjoyed. The journey to the Islands of the Caribbean for the summer vacation starts with a trip in one the airplanes that are ready to take off. The Airplane is the Scatter symbol, and if you can land five Airplanes in a row on the reels you will win a huge jackpot. For two, three, four or five Airplanes found on the reels, you will receive 1, 2, 10 or 50 coins respectively. Three of the Airplanes will trigger the free spins round, and you will start the round off with twenty five free spins for three of the Airplanes. You can get thirty five free spins for finding four Airplanes in a row, and forty five free spins if you manage to find five Airplane Scatters on the reels. During the bonus round, all wins that you may make will be doubled. The Wild is a young chap who is obviously a Lifeguard, with a surfboard, and as such can replace any other symbol in a winning combination, except the Scatter. You will have to try landing the Lifeguard Wild on the reels as often as possible for a pretty good prize. Other symbols in Caribbean Holidays include a pretty surfer girl in a bikini, a Dolphin and a Flamingo, a Cocktail and the picture of a tropical island. The lower paying symbols are the classic playing cards, from ten through to the Ace. All the playing card icons have a flower attached to them somewhere. Caribbean Holidays is a five reel twenty pay line slot game, produced by Novomatic, who are well known for their innovative ideas in creating slots games. You can activate as many pay lines as you wish, and switch to Autoplay if you wish. All the buttons you need to control the game are in a functional panel at the bottom of the screen. There is an image of a Caribbean island in the background of the slot, and all the symbols as well as the sound effects fit into the theme of the game play very well. 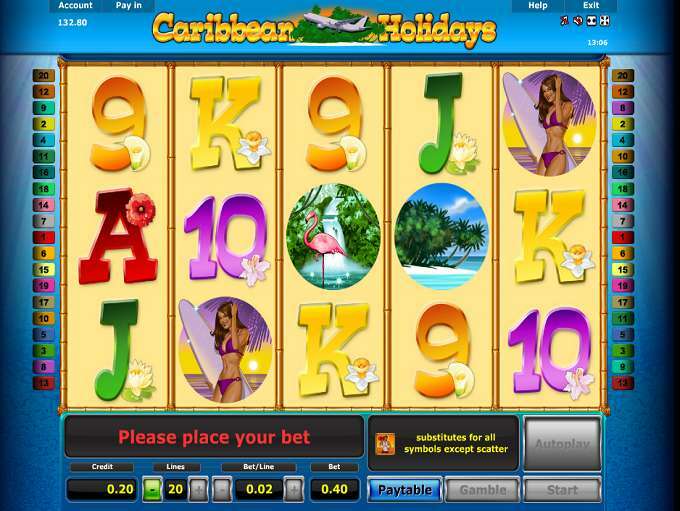 Caribbean Holidays also offers the chance of trying the Gamble feature. After every win, you can click on the Gamble button and attempt to guess correctly the colour of a random playing card. If you guess correctly your wins will be doubled. You can check the winnings table, and your prize will be at the bottom. Every jump to higher earnings will give you two options. You can gamble again, or collect the money. If you opt for collecting the money, you will be returned to the base game and the winning coins will be added to your total. Another gamble could see your winnings increase, but it could see you lose all your winnings. This tropical island slot game, Caribbean Holidays can be relaxing and fun. There are some great microgaming no deposit bonus rounds too, so you could also end up with some good payouts too.